UPDATED WITH LINK TO ONLINE APPLICATION FORM: Don't miss a chance to avoid the 'summer slide' by enrolling your child in the Summer Academy of Learning! 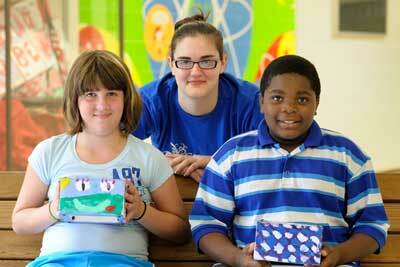 The Taylor Summer Academy of Learning is being held at Truman High School July 1-July 25. 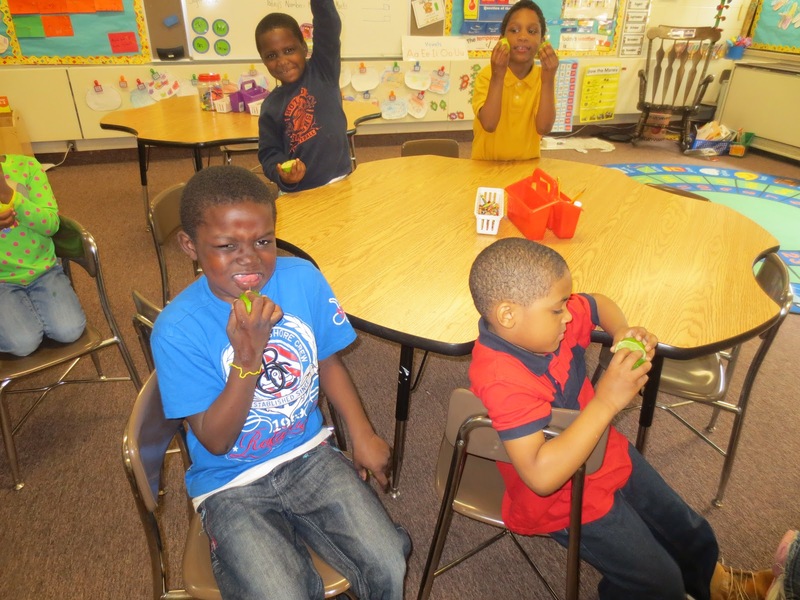 The Taylor School District is proud to offer courses through our Taylor Summer Academy of Learning that are designed by instructors to provide children with creative, stimulating and fun-filled experiences this summer. Course themes include: dinosaurs, acting, Frog and Toad stories, fairytales, math games, gardening, mysteries, building with Lego-style blocks and much more. The best part is that children are learning AND having fun. 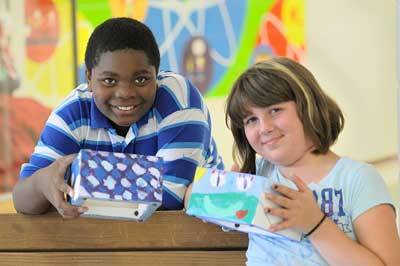 Members of the Taylor School District are eligible to attend the summer program at no charge. This program is offered to students who are going into second through eighth grades in the fall. While your child is at the Summer Academy, they will be given breakfast, go to two class offerings of their choice and receive lunch. In addition, transportation will be provided, if needed. Pupils should have brought home an application form from their school for this program. 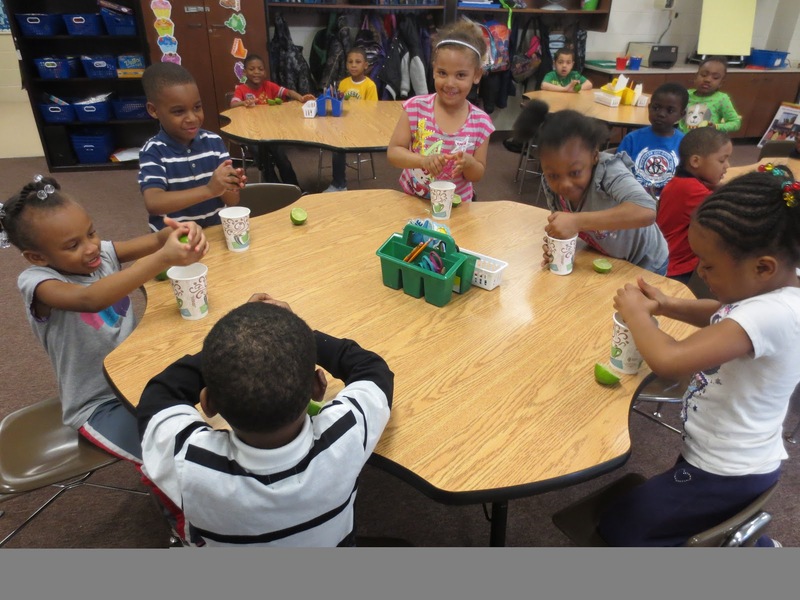 If they did not, contact the school for an additional copy or you can contact Nannette Kuhn at State and Federal Programs (313) 295-5479 Ext. 12165. 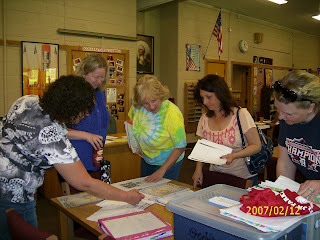 Early registration is going on through May 23. The last day to enroll is June 10. Classes are filling up fast. Research has shown that children can lose certain academic skills during the summer months. It’s known as the “summer slide” and all students experience it. 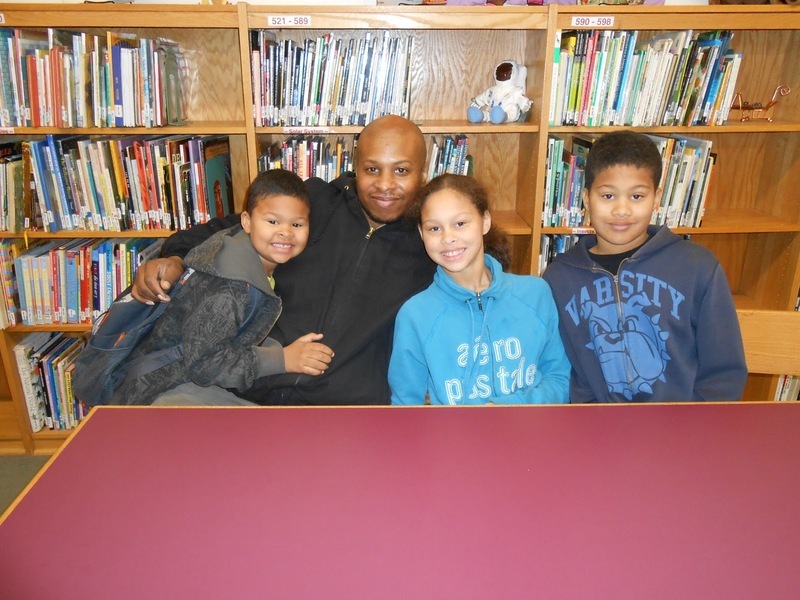 This program will help kids retain what they have learned throughout the school year. Remember: The only “slide” your children should experience during the summer is the one at the park. For more information or to access the application form online, click here. 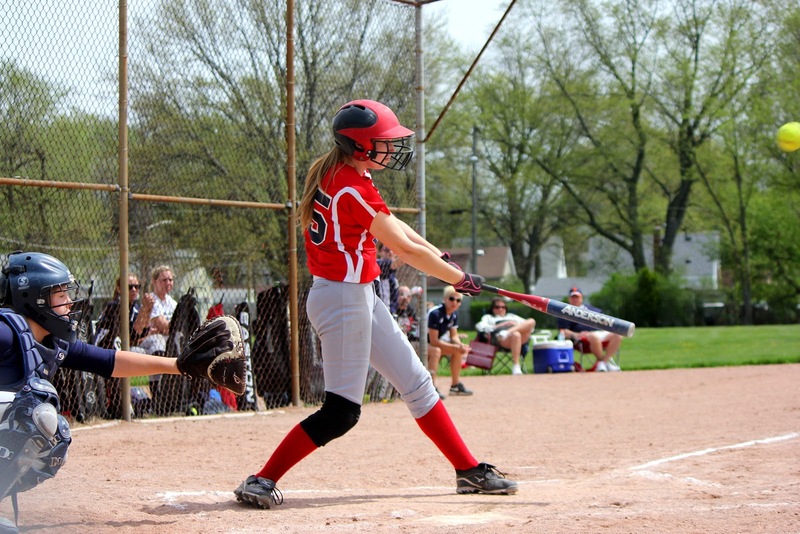 The Hoover Middle School Band recently performed during the Taylor Northwest Little League's annual parade. 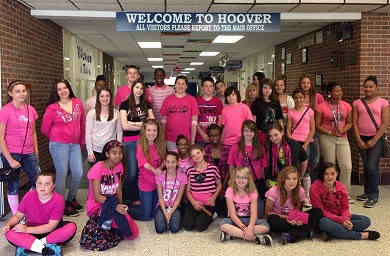 Hoover is a special place when it comes to fighting cancer! 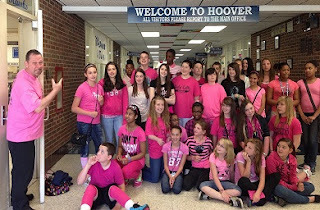 Raising cancer awareness has a special place around Hoover Middle School. One of the reasons why the school is so interested in the campaign is because of one of Hoover's own, Ms. Pasek, has fought the "tough battle" and come out on top! Yesterday and today, Hoover had key events planned surrounding "Pinked Out Day," an affair during which the entire student decks out in pink and raises donations to aid in cancer research. One dollar donations were taken all day and we'll get back with you in the near future when a total is announced. Just a couple of hours ago, Hoover hosted its Mini Relay for Life at the school. Look for more updates from Hoover on these events. And please take note that the group was "photo bombed" by the infamous Mr. Hunt (below)! 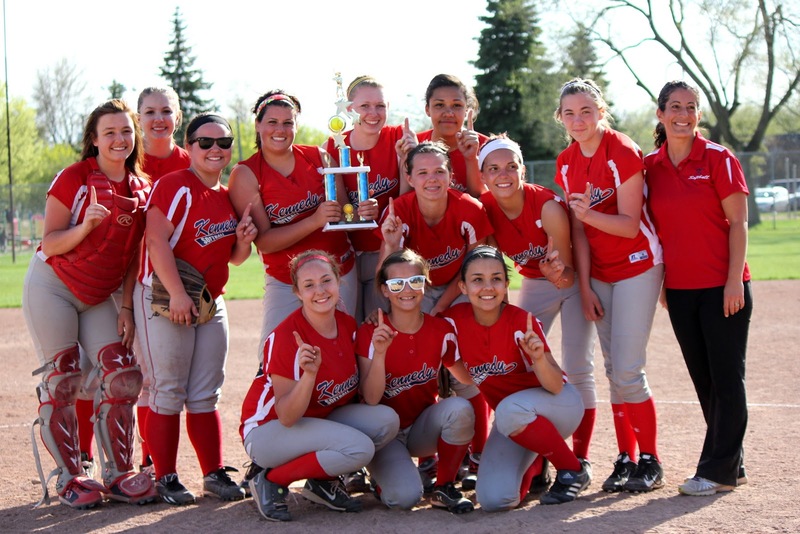 The Kennedy High School girls' jayvee softball team won the Redford Union High School Tournament last weekend -- adding another big trophy to the school's trophy case! 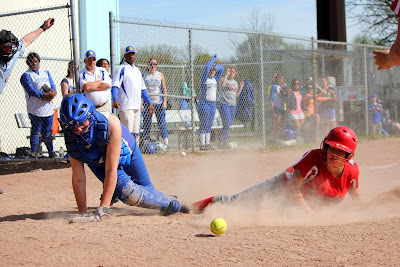 Kennedy beat the hosts in the title game, 10-7, behind triples by Lindsey Mason and Leanna Cloutier, a double and single from Katie Wilson, two singles by Rachel Haver and a home run off the bat of Elissa Sarnacki. The girls played outstanding defense, according to Coach Amy Celsi, behind the battery of pitcher Sarnacki and catcher Raelynn Carver. 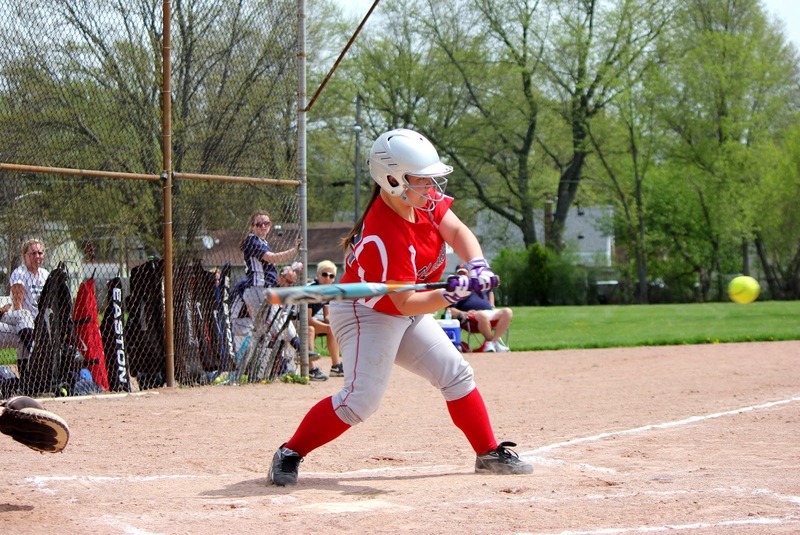 Kennedy opened the tournament by hammering Southfield Lathrup, 15-0. 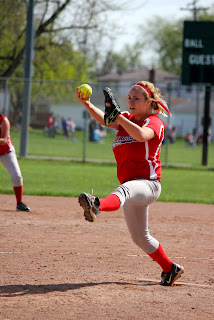 Sarnacki pitched the shutout. In game two, the Lady Eagles nipped Farmington, 7-6. 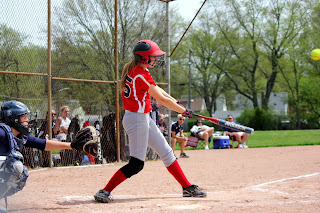 Down 6-4 in the final inning, Kennedy received RBIs from Rebecca West, Haver and Cloutier to capture the win and advance to the title game. 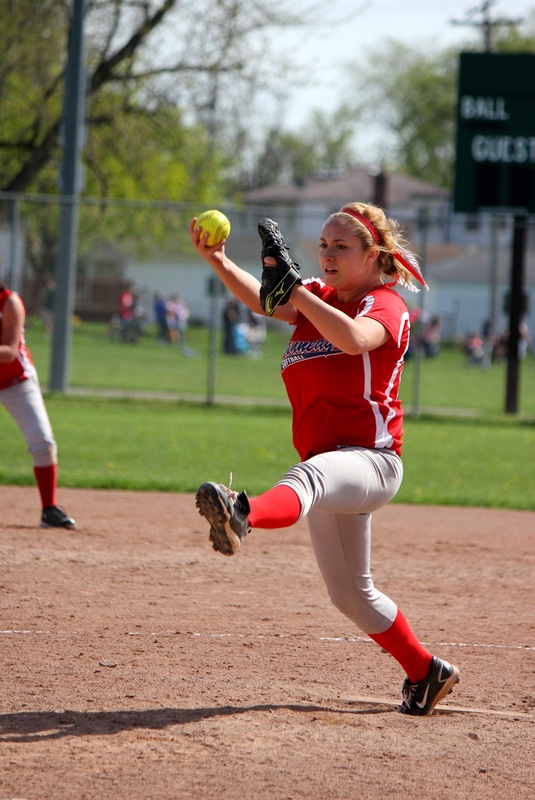 The comeback gave Wilson, who pitched, the victory. The Kennedy champs are Carver, Cloutier, Katie Doak, Zayla Estell, Haver, Olivia Long, Brooke Makinen, Marissa Marasco, Mason, Sarnacki, West and Wilson. 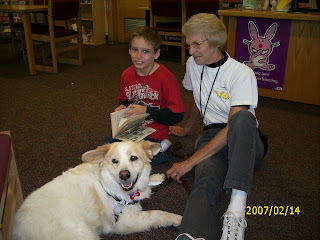 There's nothing like a nice dog to help ease a pupil into the right frame of mind to learn. 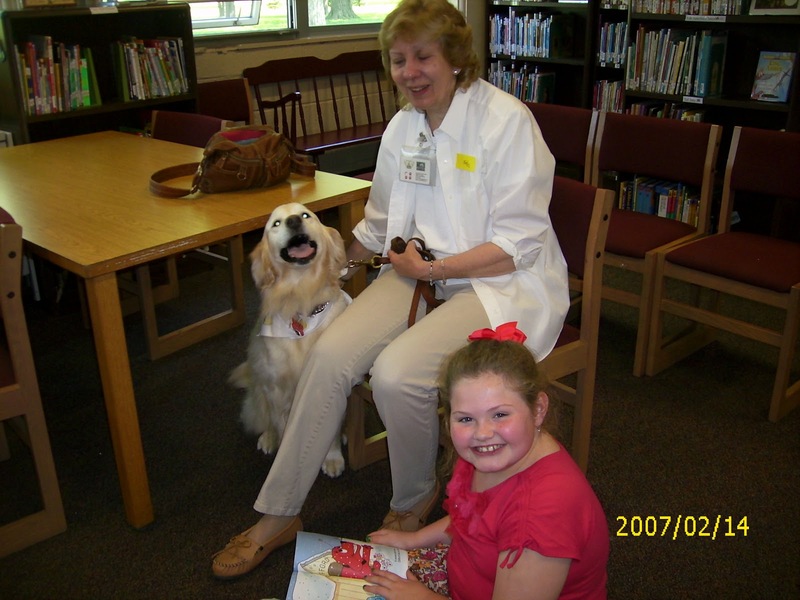 Once a month, Taylor Parks Elementary School is visited by none other than the Fur Angels, a non-profit organization that offers "compassion and unconditional love" through pet therapy. 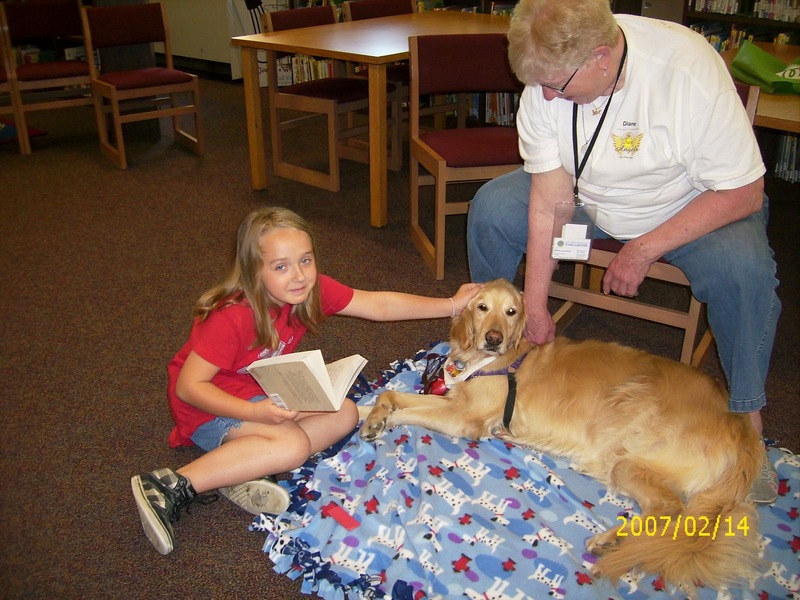 Citizen" and "Beautiful Therapy Dog Certification" before becoming part of the Fur Angels program. In other words, they have to earn their wings! The dogs create an atmosphere where pupils are comfortable to read -- a positive, non-intimidating and fun environment. That way, a child can gain confidence despite the fact that they might be struggling with new words. The program has been a big motivator to encourage better reading skills and puts more confidence in pupils. 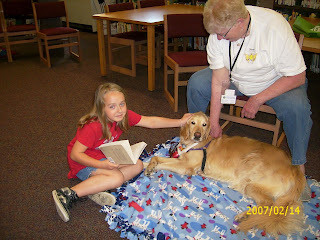 The Fur Angels work with the Taylor schools, visit public libraries, nursing homes, hospitals, etc. 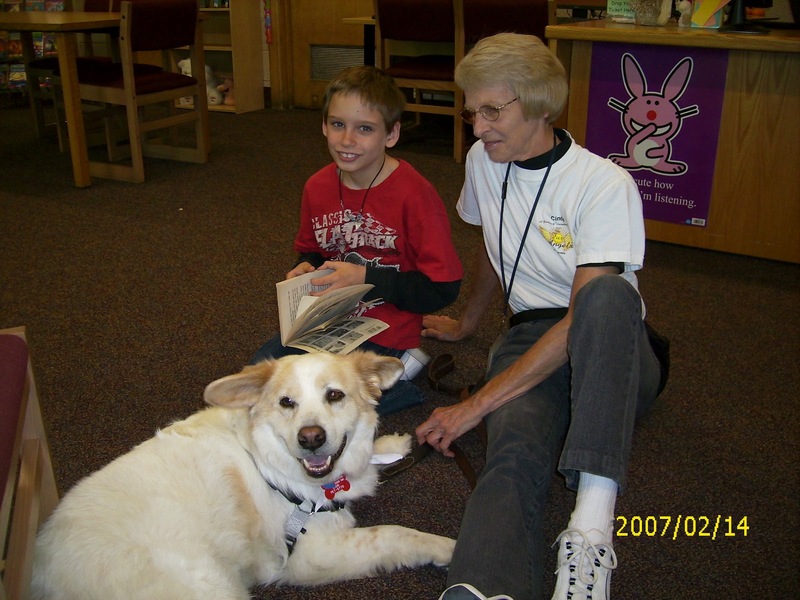 Just petting a dog has been proven to lift spirits and provide medical benefits -- like lowering blood pressure. 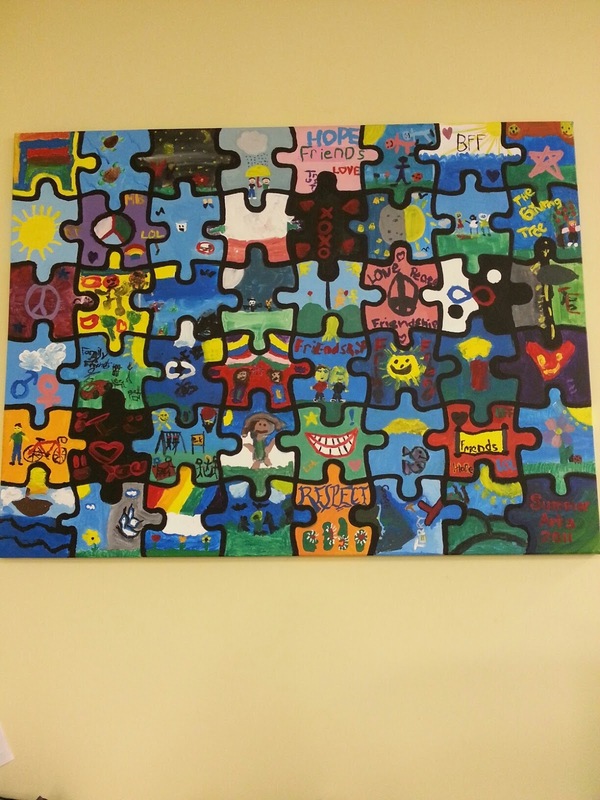 The Oakwood Taylor Teen Health Center is holding its 17th annual Taylor Summer Arts & Prevention Academy June 25 through Aug. 1 at The Sixth Grade Academy. This is a program for students entering the sixth through the ninth grades in the fall, and focuses on art, dance, music, drama -- and plenty of fun. And it's free for Taylor residents! Breakfast, lunch and transportation will be provided for residents of the city. The program runs between 9:30 a.m. and 3 p.m. Tuesdays, Wednesdays and Thursdays, with an end of summer "showcase" held for family and friends at 6:30 p.m. Aug. 2 at Truman High School. 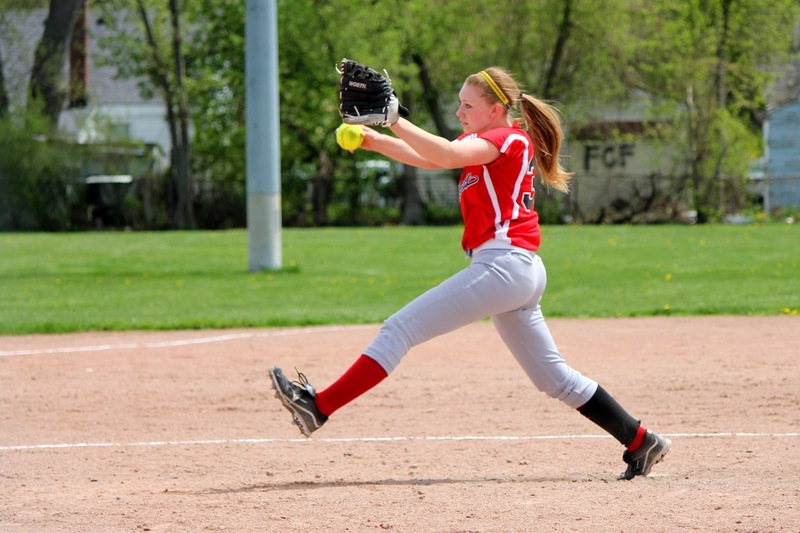 According to Mallory Pitoniak of the Taylor Teen Health Center, the program is a rewarding experience. 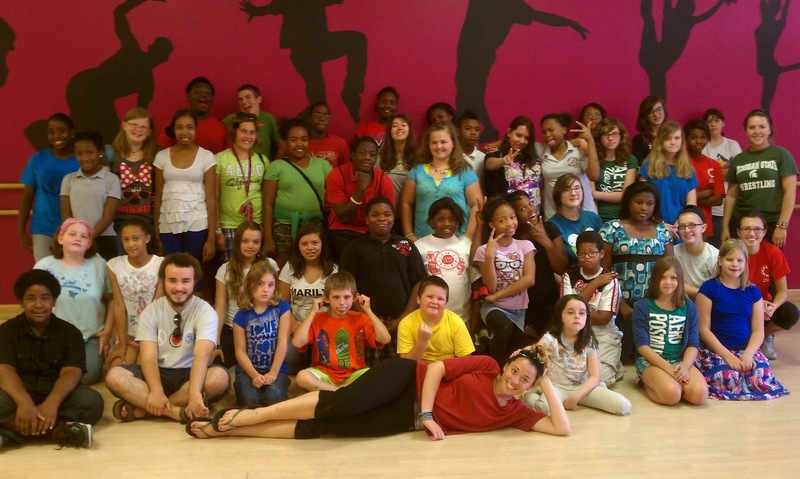 "Last year, we took a field trip to a dance studio to practice our showcase performance," she said. "The showcase is a special night at the end of our six-week program, where we invite family and friends of the participants to see the kids show off what they have learned throughout the summer." 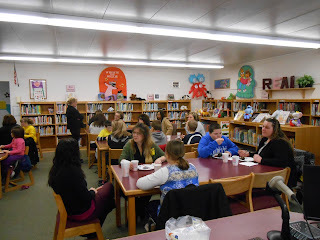 The past several years, The Sixth Grade Academy has hosted the program. 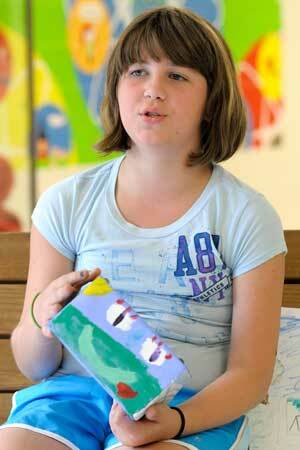 Each year, the group does a special major art project, as well as smaller art projects. In 2010, they painted a mural on the wall across from the school library. William Home Jr., 10, a participant in last year's program, and Melissa Stellini, an assistant prevention counselor for the fifth and sixth grade groups, mentioned the importance of the lessons learned in the summer program as part of a story published in an internal publication at Oakwood, "Oakwood specializes in positive opportunities." 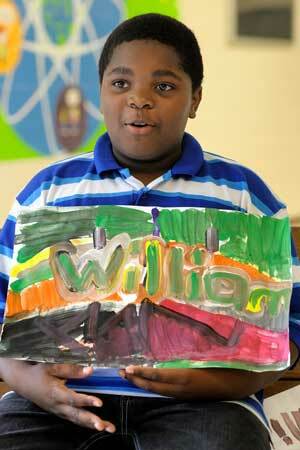 "I was mixing and making new colors for a drawing and they weren't coming out right," Home said. "So I just drew something else over them." "It was an excellent example of making a mistake and not giving up," said Stellini of Home's decision. "That's our theme -- building character." About 60 children between 10 and 15 participated in the program last year. 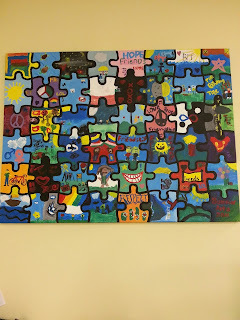 "It provides an environment for kids to come to during the summer and do things they wouldn't normally get to do," said Jamie Balavitch, lead prevention counselor at the teen center. "It's a safe and expressive environment to exposes them to the things that they might not ever be exposed to." The program was honored by the Michigan Hospital Association Foundation when it was selected the 2005 Ludwig Community Benefit Award winner. The award is a tribute to the legacy of leadership and community partnership demonstrated by Patric E. Ludwig, former MHA president and Bronson Healthcare Group president, and is presented to the member organizations that have aided their communities through healthcare, economic or social initiatives. For more about the Ludwig award, click here. 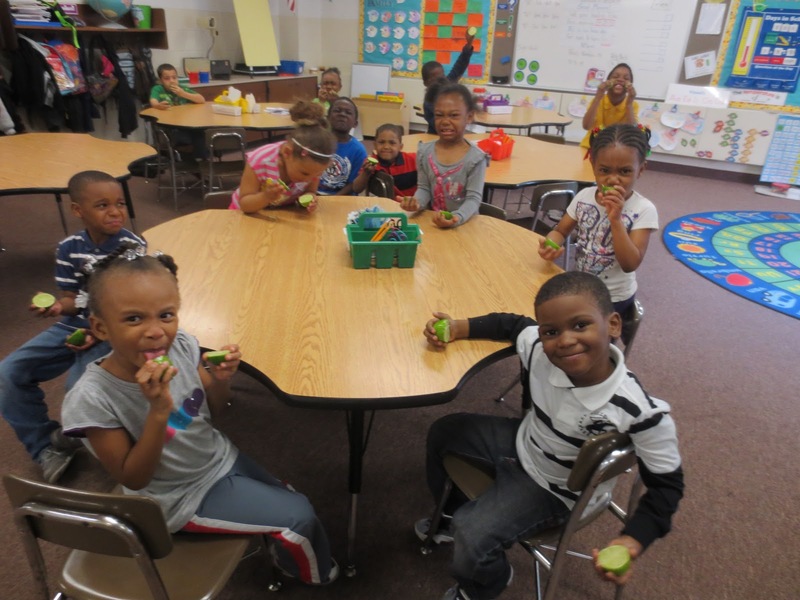 Over the years, the summer program also has been recognized as a vital community resource by state legislation, city leaders and local service organizations. For more information and applications to the summer program, call the Oakwood Taylor Teen Health Center at (734) 287-2076 Ext. 229 or 242. The deadline for applications is 5 p.m. Friday, June 14. Hot day? 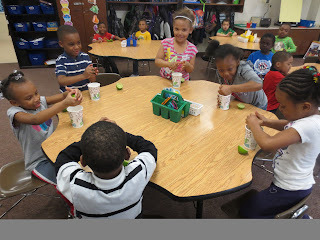 Time for some limeade at Myers! School is all about learning. And if you learn to made a few limeades on a hot spring day, all the better! 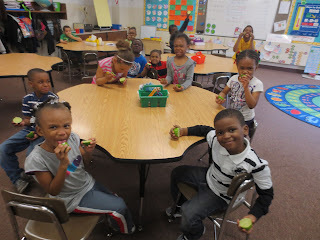 That's what Mrs. Jameson's kindergarten class at Myers Elementary School did last week, and they had a great time making them. If anyone is looking for a decent recipe for the drink, here's one via "Simply Recipes." 1 In a small saucepan bring to a boil the sugar, one cup of water, and the lime zest. Once the sugar is dissolved (which it should be by the time the water boils), remove from heat and let cool for for a few minutes. The amount of sugar is a guideline, it depends on how sweet you like your limeade and how tart your particular limes are. 2 Place a strainer over a bowl, or wide-mouthed serving container, and pour the sugar syrup through it, straining out the lime zest. Add the lime juice and 2 cups of water. Taste for sour/sweet balance. If too sweet, add a little more lime juice. Add several sprigs of fresh mint. Chill, or serve immediately over ice. Yield: Makes about 1 quart. 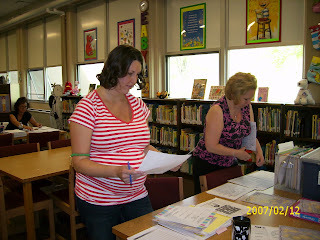 Tuesday, May 7, included professional development at Taylor Parks Elementary School. The teaching staff took part in a "Portfolio Walk Celebration," which enabled the teachers and support staff to view and gain new ideas to use in their classrooms and teaching assignments. 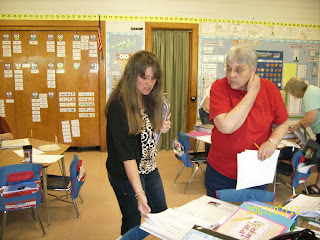 Each teacher and support staff person compiled a portfolio, consisting of artifacts, examples and evidence to demonstrate the domains of education. Tammy Keen, director of music at Taylor Parks Elementary School, was recently able to attend a lecture given by Dr. Jane Goodall, considered the world's foremost expert on chimpanzees. Keen and her husband, Joe, spend their summers at an exotic big cat rescue refuge in Florida. 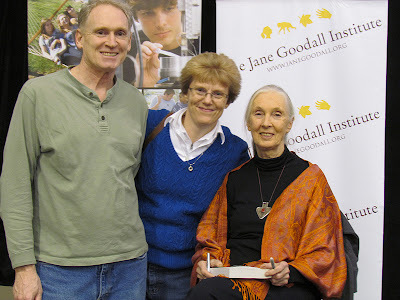 Both are animal activists and were very excited to be able to meet Goodall during the lecture and photo session. Goodall is best known for her 45-year study of social and family interactions of wild chimpanzees in Gombe Stream National Park, Tanzania. Through her unyielding patience, she was able to win the trust and open a window into these sometimes strange and shy creatures. To this day, the public remains fascinated by her work. She is the founder of the Jane Goodall Institute and has worked extensively on conservation and animal welfare issues, inspiring support on behalf of endangered species (particularly chimpanzees). "Meeting Dr. Goodall was a once-in-a-lifetime experience," Keen said. Born in England in 1934, Goodall was given a life-like chimpanzee doll named Jubilee, and thus began a lifelong love for animals. In 1957, Goodall made an acquaintance of Louis Leakey, a Kenyan archaeologist and paleontologist, who believed that the study of existing great apes could provide indications of the behavior of early man. Four years later, Goodall became the first of "Leakey's Angels," a group of women funded by Leakey to study apes in their original habitat. Goodall's work in Tanzania is best known for challenging two specific issues of the day: That only humans could construct and use tools, and that chimpanzees were vegetarians. Among other observations, she also noted an aggressive side to chimpanzee behavior, including the group hunting of smaller primates and violence between the chimpanzee troops. In 1977, she founded the Jane Goodall Institute, which supports Gombe research. Among her awards: Named a Dame Commander of the Order of the British Empire and being named a United Nations Messenger of Peace. 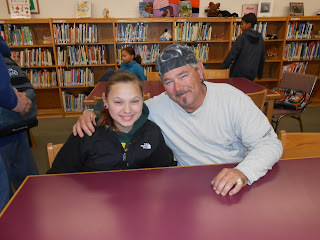 To share her meeting, Keen donated a copy of Goodall's biography to the Taylor Parks Elementary School library. 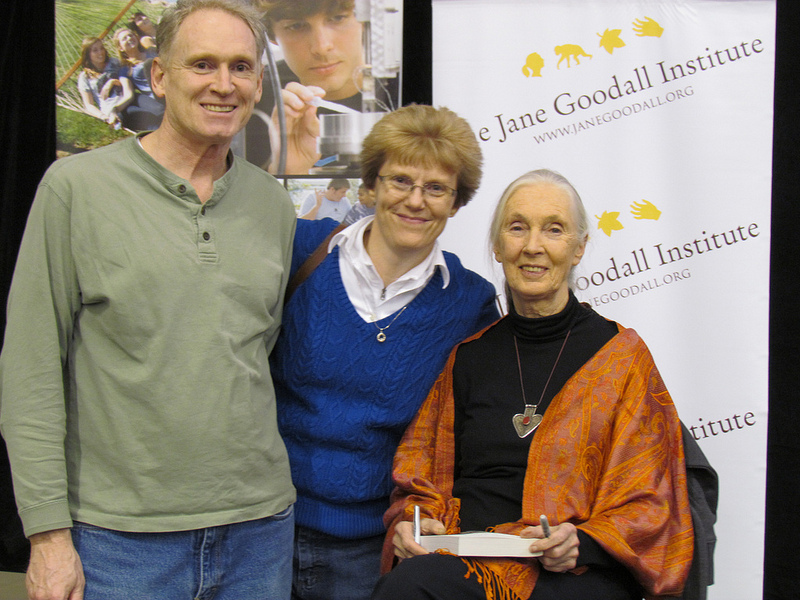 For more on the Jane Goodall Institute, click here. Get involved in your child's education if you want them to succeed! 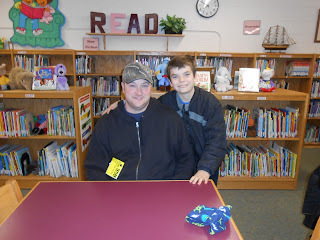 One of the most important parts of education -- maybe even the most important part -- involves parental involvement. According to the Michigan Department of Education's recently updated "Collaborating for Success" Parent Engagement Tool Kit, parents should take note of the following, among other issues. Student achievement for disadvantaged children not only improves, but can also reach levels that are standard for middle-class children. In addition, the children who are farthest behind make the greatest gains. Junior and senior high school students whose parents remain involved make better transitions, maintain the quality of their work, and develop realistic plans for their future. Students whose parents are not involved, on the other hand, are more likely to drop out of school. For more on parental engagement, go directly to the MDE's Web site by clicking here. Included in a downloadable PDF of the entire report. The News-Herald recently posted this breakdown of votes in the Michigan Legislature, via MichiganVotes.org. To access MichiganVotes.org, click here. To require drug testing of state welfare benefit recipients or applicants if an "empirical screening tool" indicates a reasonable suspicion, and prohibit benefits for six months if a person tests positive a second time (or refuses "treatment" the first time). This would begin as a one-year pilot program in three counties. To require welfare recipients who have school age children to ensure the children attend school or else lose benefits, and require the state welfare agency to promulgate rules to make it so. If the child is age 16 or 17 he or she would be "removed" from the welfare "program group," meaning the family and/or household. To require the Department of Treasury to provide a person or business who has been audited with a complete copy of the auditors' working papers, findings, and all the correspondence and documentation which formed a basis for audit determinations. Also, to require such audits to conform with standards the department would have to establish within one year, covering audit evidence, understanding of the audited entity, documentation and much more. The bill is part of a package of reforms related to business complaints regarding state audit procedures. To prohibit the "capture" by a local Tax Increment Finance Authority (such as a Downtown Development Authority) of regional property taxes imposed to subsidize the Detroit Zoo and the Detroit Institute for the Arts. To repeal a provision of the law mandating child car seats that waives penalties for a violation if the driver gets a car seat and brings the receipts to court. The bill would allow a court to waive this fine, but unlike current law, does not require it to. 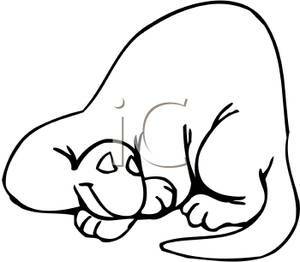 Senate Bill 288, Give NRC duty of designating huntable game species: Passed 72 to 38 in the House To give the state Natural Resources Commission (in addition to the Legislature) the power to designate a species as a huntable game species. The commission could not designate mourning doves as a game species, but potentially could designate wolves. Also, to allow members of the military to obtain hunting and fishing licenses for free. To mandate that antifreeze engine coolant sold at retail in Michigan must have a "bittering agent" added to make it unpalatable to children, dogs and other animals (who are attracted by the sweet taste of antifreeze, a deadly poison). MichiganVotes.org is a free, non-partisan website created by the Mackinac Center for Public Policy, providing concise, non-partisan, plain-English descriptions of every bill and vote in the Michigan House and Senate. News-Herald Staff Writer Dave Komer recently covered National Day of Prayer observances in Taylor. This is his report. Almost 200 people turned out for a National Day of Prayer observance at the Cameron G. Priebe Municipal Plaza recently, including Taylor School District Asst. Supt. Teresa Winnie, who spoke at the event. A cadre of religious and city leaders took turns at the podium leading prayers for unity, peace and wisdom for the city and the world during the one-hour program. The UAW Region 1A Honor Guard attended, as well as Gilead Baptist Church musical duo Jack Smith and Craig Brown. The two performed the national anthem and “God Bless America” to open the ceremonies and sang “God of the City” at the end of the program. Prayers were offered for the country, President Barack Obama, America’s armed forces, life, marriage and moral issues, housing, business and the economy, and for state leadership and Gov. Rick Snyder and first responders, among others. Featured speakers included Pastor Philip Nissley of the New Hope Assembly for God; Pastor Cliff Molnar of Victory Ministries; Bishop Gary Harper of Greater Grace Temple; Pastor Thomas Downs of Gilead Baptist Church; Pastor John Reilly of Beacon Baptist Church (he’s also the school board president); Linda Linden, director of Guiding Hands Pregnancy Refuge; John Carter, the Taylor Housing Commission’s executive director; City Council Chairwoman Cheryl Burke; Bishop J. Andre of Heritage Park Church of God; Pastor Ryan Bettinger of Northline Baptist Church; Pastor Bill Fix of Journey of Hope Community Church; and Jeremy Waechter, head of the Taylor substance abuse prevention task force. Winnie spoke, praying to strengthen the school district’s administrators and students. The Rev. Leo Sabourin of Saint Constance Catholic Church prayed for the news media, arts and entertainment and unity. To view the story and video on The News-Herald Newspapers’ Web site, click here. Healthy lunch ideas result in art kid winnings at Holland! Nothing like a little creative competition to get the taste buds going! 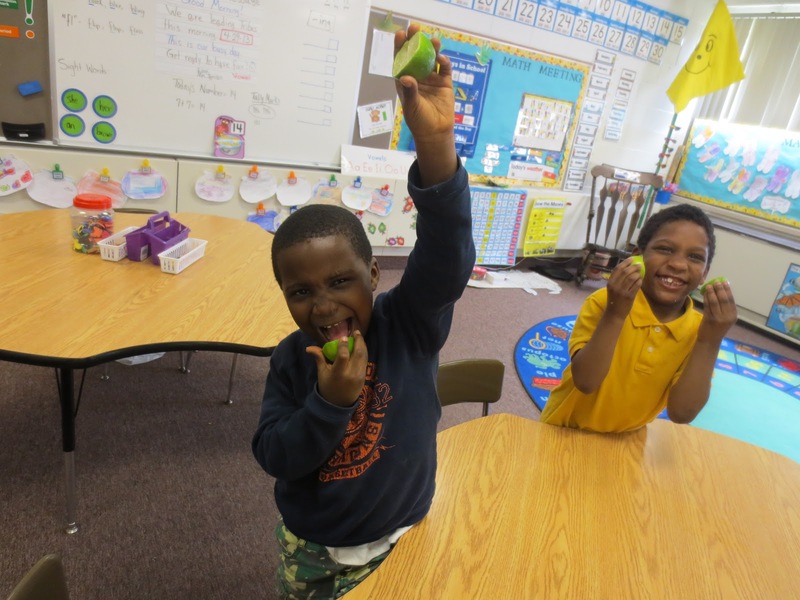 Eating healthy is an important topic in education today, and it's no different around Holland Elementary School. Recently, pupils took part in a contest to win an art kit, compliments of the school's food service department. 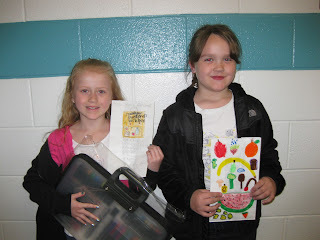 Every child was given a lunch bag to decorate with their idea of a healthy lunch. They could use crayons, markers, colored pencils or colored paper to complete the project. According to school staff, the pupils did a fabulous job and created some really outstanding -- and healthy -- lunch ideas. 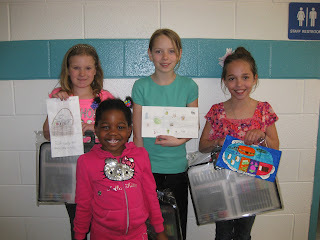 Holland's cooks had the difficult task of selecting one winner from each classroom. Hats off to the winners of the competition at Holland. 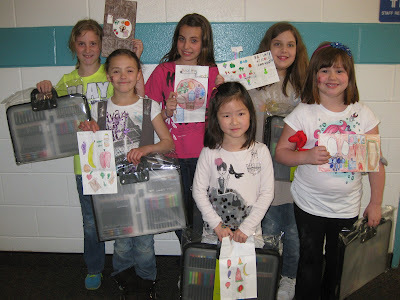 And many thanks to the food services department for supplying the wonderful art kits! Moms and dads grab some treats at Holland! 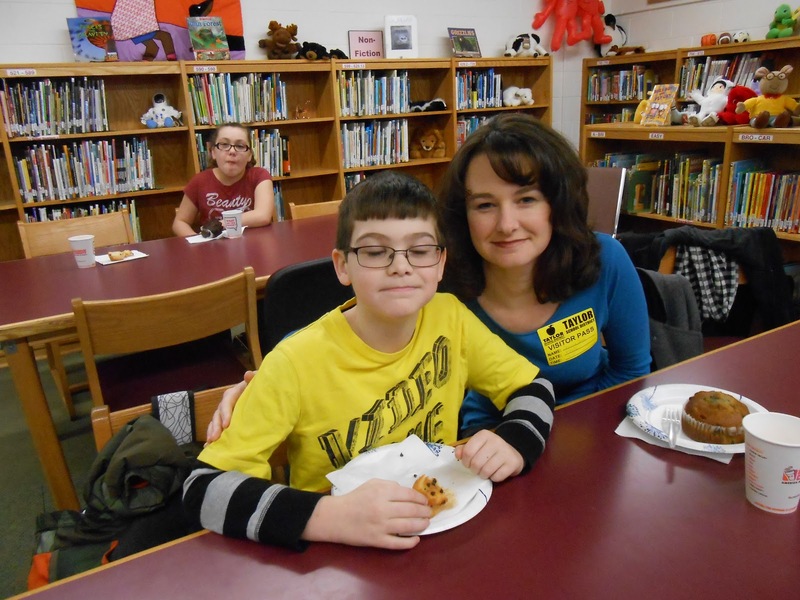 Holland Elementary School recently hosted its "Moms and Muffins" and "Dads and Doughnuts" events, bringing families of pupils into the school building. Jackie Smith passed along these great photos of the events. 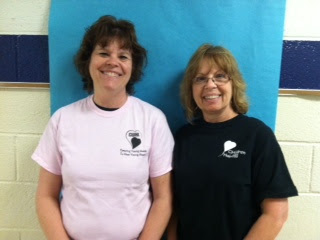 A couple of teachers are Blair Moody Elementary School got a haircut recently, and it was for a good cause. 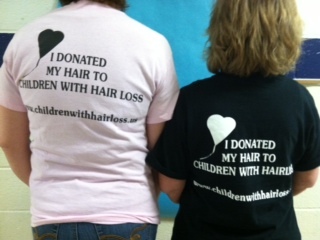 Elaine Strugala (in the dark shirt) and Liz Shiroda donated hair to Children With Hair Loss, a charitable group. 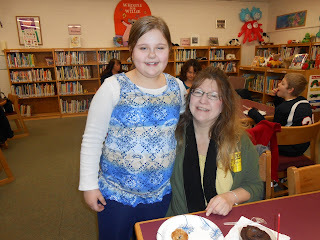 Elaine donated five braids of hair and Liz donated two ponytails. The teacher chose the organization because any children who needs a wig can receive one for free from it. And it takes 20-30 ponytails to make just one wig!